H1N1 death toll estimated at 3,900 in U.S. The Department of Health and Human Services has ordered 75 million doses of H1N1 vaccine for delivery by year's end. Atlanta, Georgia (CNN) -- Nearly 3,900 people, including about 540 children, are believed to have died from the H1N1 flu in the first six months of the epidemic, the Centers for Disease Control and Prevention said Thursday. The figure is a sharp increase from previous counts of laboratory-confirmed cases. But Dr. Anne Schuchat, the director of the National Center for Immunization and Respiratory Diseases, said the estimate gives a "more accurate picture" of the scale of the pandemic. The figure was based on a detailed analysis of data from several dozen districts around the country, she said. The method used to calculate the mortality figures is similar to that used to produce estimates of ordinary seasonal flu deaths, which are believed to number about 36,000 a year. An estimated 22 million people in the United States have contracted the virus, commonly known as swine flu, resulting in about 98,000 hospitalizations through October 17, Schuchat said. Among children under 18, about 8 million are believed to have been sickened, 36,000 have been hospitalized and 540 have died, a much higher number than the 129 laboratory-confirmed child deaths the CDC reported November 6. About 12 million adults up to age 64 had been reported ill, with 53,000 hospitalizations in that age group and 2,900 deaths. People over age 65 accounted for 2 million illnesses, 9,000 hospitalizations and 440 deaths, Schuchat said. The prevalence of flu cases is higher than at any time since the 1918 Spanish flu pandemic, she said, but the death rate is "nowhere near the severity of the 1918 pandemic." Schuchat said 41.6 million doses of H1N1 vaccine are now available, up from 38 million last week, but "not as much as we'd hoped to have by today." She told reporters last week that about 8 million new doses were expected this week. 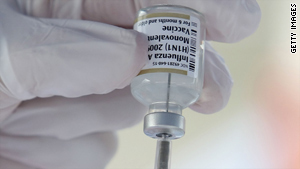 The Department of Health and Human Services has ordered 75 million doses of swine flu vaccine for delivery by year's end, and the CDC had predicted that 40 million doses would be available by the end of October. Production delays have hampered agency plans, and the lag has led to criticism of the program. A CNN/Opinion Research Corp. survey released Tuesday found Americans are starting to lose confidence in the government's ability to prevent a nationwide epidemic, though a narrow majority continue to say that the government and private industry will eventually produce enough of the vaccine to inoculate everyone who wants it.